Even with Carmelo Anthony out nursing a bum ankle, there was some hope going into these back to back Raptor games that the Knicks could find a spark and possibly go into the New Year just one game out of first place in the Atlantic Division. What New York and their fans got was a painful reminder of just how bad this Knicks team is. Despite playing hard down the stretch, New York displayed the worst of their defensive woes with needless switching and bad rebounding, allowing the Raptors to weather a late rally and storm back themselves to close out the Knicks. KILLED ON THE BOARDS: The Knicks losing the rebounding battle is no surprise (45-37), but giving up 13 offensive rebounds is a death blow. The Raptors got so many second chance opportunities in the fourth. The Knicks were put into defensive scrambles that lead to open drives and three-pointers. Most disappointing here was Tyson Chandler, who managed just 2 rebounds in 27 minutes of play. RAN AROUND THE COURT: The gave up three big runs over the course of the game that made winning this game unlikely. With the score tight early in the second quarter, the Knicks went into a zone defense and succumbed to a 12-0 run to go down 52-41. Overall, they were outscored 31-22 in the quarter and down 57-44 at halftime. In the third, the Knicks were on the wrong side of a 15-2 run and were behind by as much as 23 points before chipping away to take a 85-71 deficit into the fourth. HAVE ALL THE 3-POINTERS YOU WANT, TORONTO! : The Raptors shot a deadly 47% from downtown (15/32), with Terrence Ross hitting a career-high seven treys. The perimeter was wide open and every guard, and even a forward or two, seemed to get in on the fun. The Knicks couldn’t rotate in time, and the constant, flat-out idiotic switching created repeated mismatches in Toronto’s favor. THE PLAY THAT SEALED IT: Amar’e Stoudemire’s post-scoring, along with some good passing from Toure Murry, were the main factors in allowing the Knicks to trim the lead to six, 101-95. Demar Derozan had the ball and got away with pushing off Murry, who toppled to the floor. When Derozan tried to fly past, Murry reached out and swiped him, which Derozan sold well by toppling over. The hit was ruled a flagrant, leading to a five-point swing with both free throws made and a three-pointer swished on the extra possession, puting the Knicks in an 11-point hole (106-95) they never crawled out of. JR THE PG: Raymond Felton and Pablo Prigioni being out continues to hurt badly. There were a few plays down the stretch that went nowhere due to JR having to be a playmaker and set up the offense. THE POSITIVES BECOME NEGATED: Stoudemire (23 points, 9 rebounds) and Chandler (16 points) had solid scoring games, but the lack of defense neutralized that. The team couldn’t get stops or rebounds when it mattered. 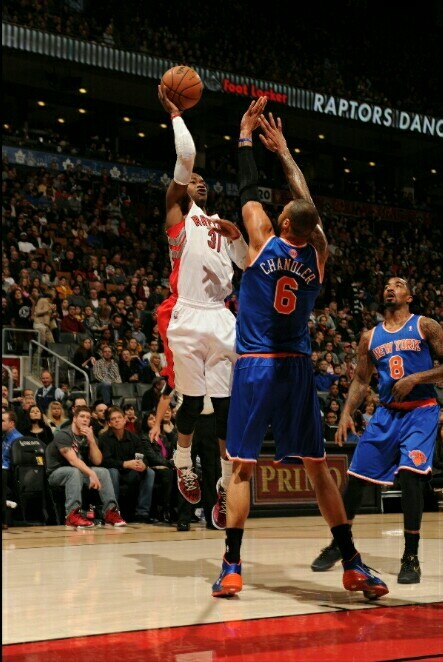 Woodson opted to sit Andrea Bargnani (12 points) in the fourth. Like last night’s game, Bargnani started strong in first and became a non-factor in the ensuing quarters. NY BACKCOURT: JR Smith was 1-8 until late in the game, still managing to put up a respectable stat line of 13 points, 7 rebounds and 6 assists. However, with the Melo out the team was in dire need of scoring and playmaking, two things he couldn’t shoulder. Woodson went with Murry over Beno Udrih, who had already notched 4 turnovers before the fourth. Murry made some bad passes himself, but he at least showed some semblance of defense. Iman Shumpert played like he wanted to be left in Toronto with Landry Fields and Steve Novak. He constantly gambled (and lost) on steals, leading to his man beating him backdoor for layups. FRUSTATION LEVELS HIGH: Shumpert was seen barking back at Woodson in the waning minutes. Chandler also shoved Jonas Valanciunas under the basket. After the game, Chandler had to restrained by Herb Williams for some unknown reason. FROM TERRIBLE BACK TO BAD: Is there any hope going into 2014? Well, at least when Melo finally comes back, the team will still be bad and flawed, but just a little less terrible than they are right now.